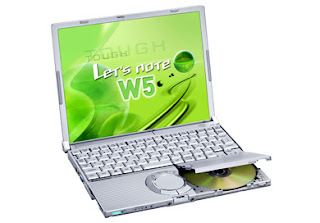 Panasonic’s Toughbook CF-W5M is an ultraportable 3.1-pound notebook designed for both work and play. For $2086.71, the CF-W5 configuration features very nice performance that comes courtesy of a 1.06-GHz Intel Core Duo processor, 512MB/1GB of DDR2 memory, a 60GB SATA HDD, and a 12.1-inch display. Video after the break.